Minosa: They may be cheaper, but look were they end up! They may be cheaper, but look were they end up! For all of you that are considering the Minosa washbasin collection and feel they have seen or can buy the "same" product for half the price then this POST is a must read! 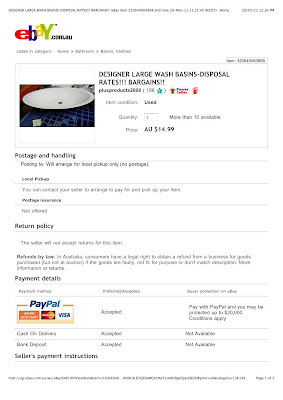 I was scouting eBay this morning as we are looking to post a few ex display vanity units & i typed in "Designer Washbasin" (as you do) and was quite amazed at what I found....The below is a extract of the eBay listing which you can see if you follow the link at the bottom of this Post. 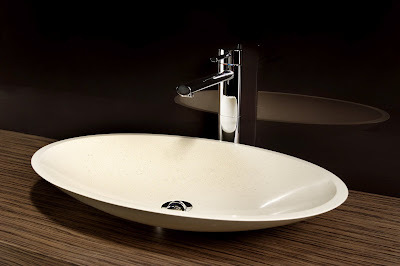 Minosa created the Ovo washbasin way back in 2005, apart from the sales of this washbasin we can tell it is a success just from the amount of copies there are on the market here in Sydney, ....there is three or four copies getting around that are made from "Corian Like" products and this is one of them. It looks to be the Marblo version but it is hard to tell as most of the copies are identical, replica's of replica's. This replica sells for more than $500.00 (not including the waste) which for a lot of you is justification enough to buy the replica as it is half the price.....but to say it is half the product is being very kind indeed. 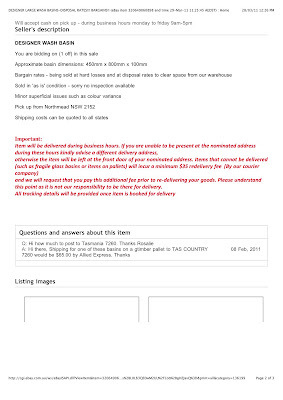 The product on this link would not be 3 years old and they are already being sold on eBay for what can only be called a joke! To have so many of them for sale really makes me think and forced me to blog this! These products are just rip offs that are made from second rate materials (compared to Corian) generally mass produced in China from polyester based materials or Acrylic "like Corian". These copies are made/imported from companies that see a good idea and think they can profit from copying the design and mass producing; they create a smart "designer" looking website or display and sell them as "like" products. The only real similarity is the look! Look closely and you will see the difference. The worst part is these products can be found in most of the prominent showrooms selling modern bathroom products Australia. It will be interesting to see how many of these products are displayed thru these "agents" over the next 5 years...my guess would be not to many. 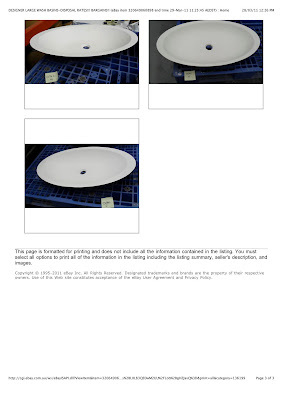 Although the below is for the "used" washbasins it is a true reflection on the quality of these washbasins. 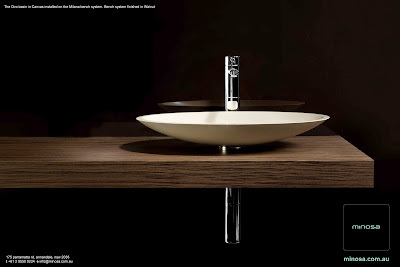 Corian will not suffer from "Superficial issues" nor will it discolour. Minosa is 10 years young this year (amazing how quick it goes) and we have NEVER had a return or complaint about our washbasins surfaces in anyway shape or form, in fact in 10 years we have only ever had one return.....this was more of a upgrade than a return as the client had purchased one of the first Puddle washbasins some 7 years ago; they had fallen in love with the Ovo washbasin, so we traded in their older washbasin for a new one. Remember that in time you are only left with the quality! Corian is the original Solid Surface Material and is highest performing Solid Surface on the market and has been for 40 years...PERIOD.